Well, the winds changed direction again, and blew me back to where I had been a few weeks ago... wanting to work in nine patch, exploring cross designs. This time inspiration sprang from looking at images of vintage and often hand-painted Parcheesi boards. (Have a look at my Pinterest board here to see some great examples). Keep in mind, I had no interest in making an actual duplicate of these vintage Parcheesi boards, as the interest for me always lays in the unexpected and the not knowing. 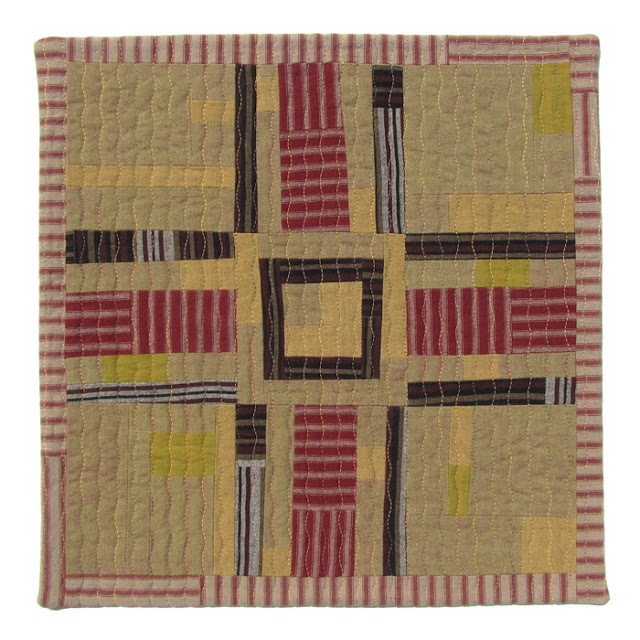 But it was wonderful to just have the images of those old game boards dancing in my head as I hand-cut the fabric pieces and sewed them together. I also sewed two others from the lovely hand-dyed indigo fabrics gifted to me last week and I will share them in my next post. PS. I am happy to report that youngest daughter is all settled in at college, and seems to be loving it. And while I miss her, the adjustment on my end has been much easier then anticipated... truth be told it's liberating not to be on parental duty 24/7! Wow! I'd never noticed how much vintage game boards look like quilts. What a great source of inspiration. I love these! 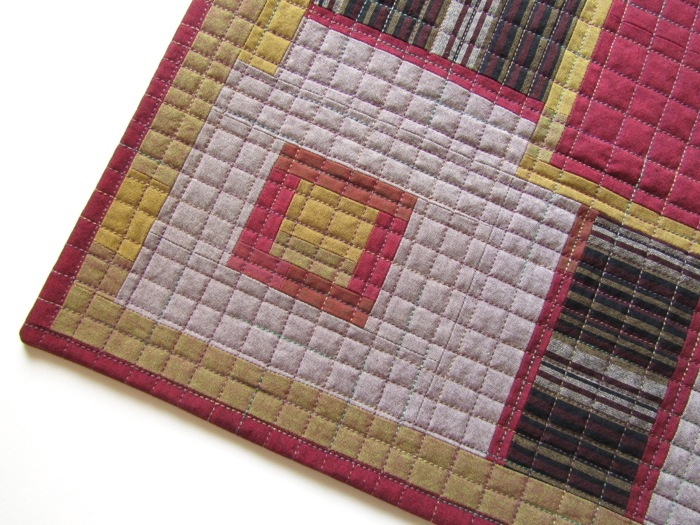 I love squares and the colors are great. 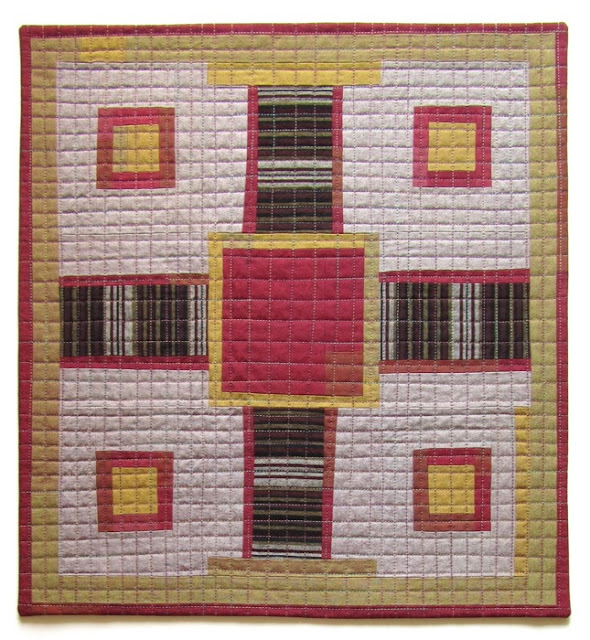 Love these designs, and especially the quilting. I've been watching your Pinterest and waiting for this! Enjoy your new "me time"! I'm sure you will fill it wisely. How did you quilt the bindings? That really adds such a nice touch. Kim, I was being tricky! It only looks like I've quilted the binding! 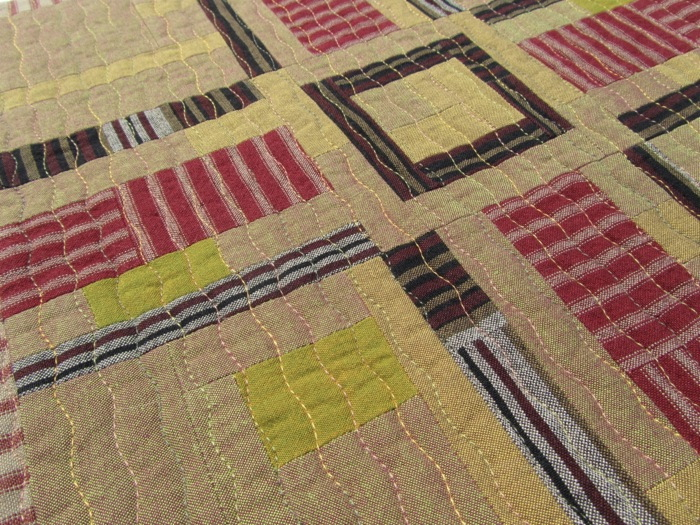 In actuality, the whole front of the quilt is patchwork, and what looks like binding is just part of the patchwork. Instead of using a traditional binding to finish the quilt, I did a facing finish, (where the binding is turned all the way to the backside). I have just only recently begun using this method, and I really enjoy it. I love this piece, especially the choice of fabric for the border. I can't imagine how life will be without my daughter at home. It's comforting to know we will adjust, and that parental duty break would be nice! Люблю геометрические квилты. Приятные цветовые оттенки, неяркие и гармоничные. Интересно, стежка какими нитками по толщине? They are unusual, and very beautiful. By the way, my last is going to college next week...and I do not foresee the 'empy nest' syndrom...am I a bad Mom?!? Ольга Т, I used a 12 wt. cotton thread on No.1 and a 40 wt. cotton thread on No. 2. The stitch length for both was set to 3 on my machine. Blandina, Ha! I know you are kidding, but for the record not only aren't you a bad Mom, I'd say you are a really healthy and well adjusted Mom! Victoria, These are beautiful! The use of the striped fabric is stunning. I was suprised that you used 12wt. on the first one. I thought 12wt. would be too heavy of a thread to go thru a sewing machine. What size of needle did you use? 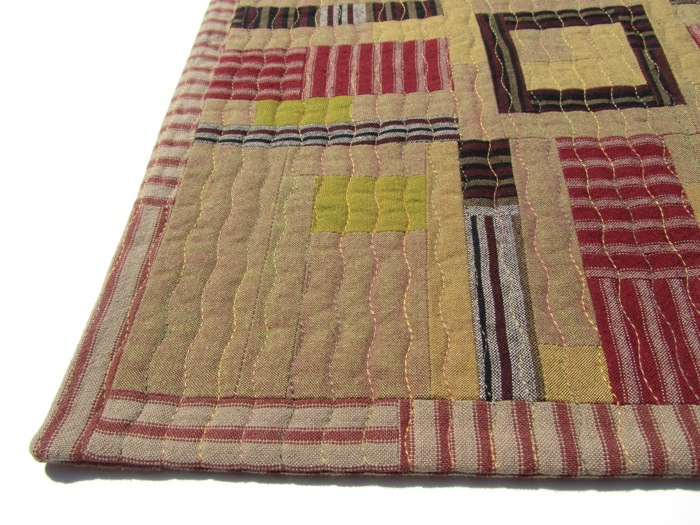 I use a topstitch 16/100 for most of my machine quilting. And the facing binding - perfect choice. I use that method all the time on wall pieces. Indeed, those DO sort of look like Parcheesi! Fun! My favorite parts are the tiny squares of light chartreuse in the second one! Patty, So far no real trouble, although at times the thread can break, and I find that I have more trouble with free motion quilting when using 12wt. thread. I also sometimes get skipped stitches, (very aggravating) but there seems to be no rhyme or reason to why it happens. I also find that small projects work better, I am guessing because there is less pull and everything just glides better. 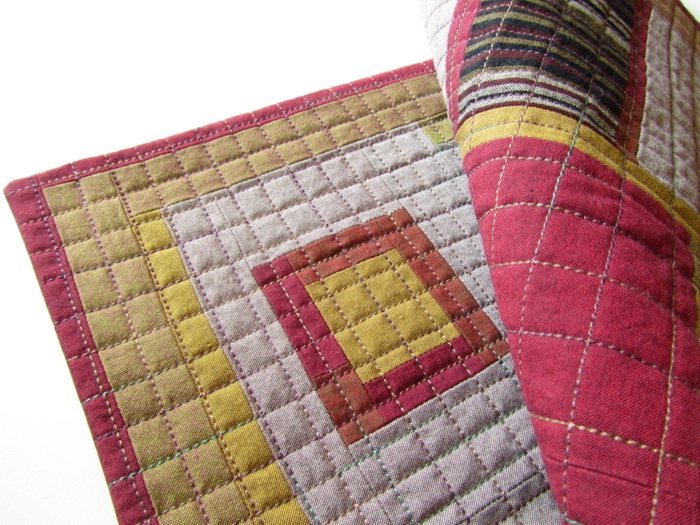 I usually stitch on my 1630 Bernina and for this quilt I used a top stitch 80/12 (Schmetz brand) as that is what I had on hand. i like the folk art cross. i can see it hanging in a church.